How do we ensure you’re well taken care of in your long-distance and international moves? Mordue is an award-winning agent of the Arpin Van Lines Network, a company consistently ranked as one of the top five national van lines and an industry leader in household goods moving and storage services for corporate, government, military and residential customers. We at Mordue are proud of our association with Arpin, consistently recognized as a leader in quality service, safety and environmentally friendly moving. Arpin has won safety and service awards from industry associations and publications, numerous nationally leading real estate and relocation companies, and corporate clients. They are a certified ProMover by the American Moving and Storage Association and an accredited business with the Better Business Bureau, a charter member of the New England Green Building Council, a participant in numerous green move initiatives and a leader in renewable energy use for the moving industry. Arpin has more than 100 years of experience in providing excellent service. And with Arpin’s 7 Point Customer Care Promise, you can be confident that your possessions will arrive safely. As an Arpin agent, Mordue must consistently maintain stringent service standards and achieve high-level quality scores. Plus, we have nationwide support to help with 24/7 customer service, complete destination services, and hassle-free claims management, if needed. You can count on Arpin and Mordue to provide a quality move experience. 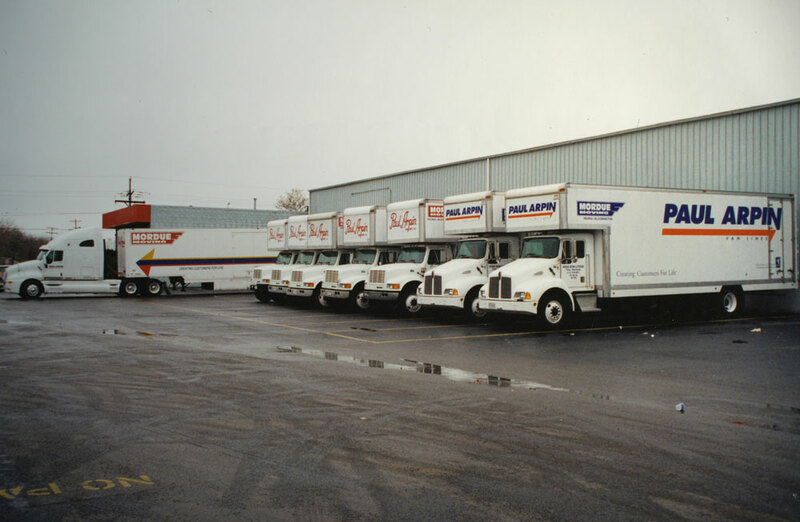 A few Mordue trucks, 1994.